The lineup of photodiode array detectors consists of the SPD-M20A and SPD-M30A. Both models are temperature-controlled, heightening data reliability and baseline stability with respect to room temperature fluctuations. The SPD-M30A incorporates a new type of capillary cell to function as a higher-sensitivity and lower-dispersion system. The SPD-M20A is an easy-to-use model that covers a wide detection range. 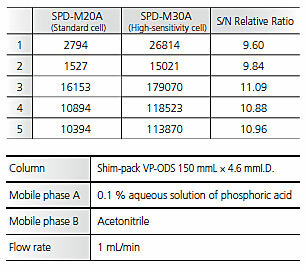 The SPD-M30A high-sensitivity cell is also effective under HPLC conditions. The analysis below shows a comparison of measurements of caffeine in a commercial soft drink using the SPD-M20A and SPD-M30A. It is apparent that the SPD-M30A improves the S/N ratio by up to eleven times. This technique fully separates unseparated peaks and visualizes small peaks hidden by a principal component. It is convenient when poor separation occurs under conditions for accelerated analysis and for quantitation of small peaks overlapped by a principal component peak. This powerful technique permits quantitation of samples in the high-concentration range. It enables the simultaneous analysis of high- and ultra-low-concentration samples and the creation of calibration curves across a broad concentration range. The RF-20A/20Axs fluorescence detectors offer world-leading* sensitivity and ease of maintenance. 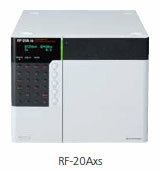 The high-sensitivity RF-20Axs model incorporates a temperature-controlled cell with cooling functionality. This maintains a constant detector cell temperature, even if the room temperature fluctuates significantly, to ensure superb reproducibility with no drop in sensitivity. * As of August 2013, according to Shimadzu survey. An S/N ratio of 21.5 was achieved for an injection of 10.48 fg anthracene (RF-20Axs). This is equivalent to approx. 1.5 fg limit of detection (S/N ratio = 3), which is excellent. The highly sensitive simultaneous analysis of multiple components requires detection at the optimal wavelengths. The RF-20A/20Axs permit ultra fast, high-sensitivity multi-component analysis using wavelength switching via a time program. Using detection at a single wavelength when performing multicomponent simultaneous analysis of components with different optimal detection wavelengths necessitates sacrificing sensitivity for certain components. The RF-20A/20Axs detectors eliminate this issue by incorporating a four-wavelength measurement function that permits detection of each component at the optimal wavelength. Detection using wavelength switching in the left-hand diagram exhibits incomplete separation in area (1) and one peak of reduced size in area (2). In such a case, setting up to four optimal wavelengths enhances the quantitative analysis accuracy by reducing the effects of adjacent peaks and improving sensitivity.